Did you realize it is only 159 days until Christmas?!?! If you are like me, then you haven’t been very strict in saving for those gifts we plan to buy. But there is still hope! First, sit down and SET A BUDGET. Do your children really need 10 or more presents each? No! Personally, I set a 3 gift maximum for my children since I know that they will receive lots of things from other family members. Now, how much will you spend? $500? $1,000? Divide that amount by the number of months left until December and that is how much you need to save each month and stick to it! It will be a less stressful holiday season if you aren’t constantly looking for extra money to buy gifts with. Secondly, start looking for gifts now. Our own Ministry Coordinator has been shopping all year looking for deals to add to our Christmas Shop and she’s found some awesome things on sale, closeout and even new items at Goodwill! There will be loads of sales coming up (End of Summer/Labor Day) so look for deals now–but DON’T GO OVER BUDGET! Black Friday and Cyber Monday deals might seem too good to pass up– but not if you can’t pay your utility bill or rent! And don’t forget about homemade gifts! Pinterest is a wealth of ideas –from the simple to the more advanced. My family and I bake cookies to share with our neighbors, and my children love to make homemade cards for our friends and family. These gifts can be treasured much more than something bought in a store. 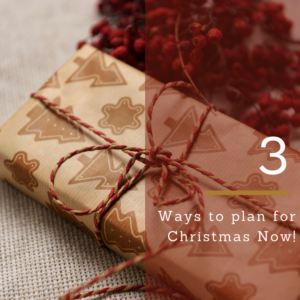 So, if you plan ahead, you can make the holiday season so much more fun and enjoyable. Budget, save, and focus on your family and building traditions for years to come. Now, wouldn’t that be a Christmas memory? More saving tips and ideas can be found by visiting Dave Ramsey’s website. Interesting in learning more about saving? We are beginning a series of 5 classes called Financial Foundations (Dave Ramsey). This series is for teenagers and their parents and will be taught by BSHS’s Marsha Pucetas. Participants will also be offered the chance to enroll in our Saving Up! Program where your savings up to $150 will be matched! Call Carolyn to register! 578-6013 x 1621.